The Federal DOT Federal Motor Carriers Safety Regulation, §396.11, requires that every motor carrier driver carry out an inspection of their vehicle on a daily basis. There are dozens of available forms for this. But what if your customer wants to inspect the vehicle in a certain order. Then they need a custom Driver's Vehicle Inspection Report. 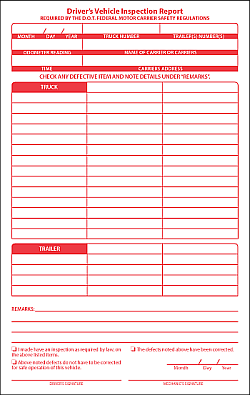 (DVIR) Give your customer our fillable PDF and let them list the inspection items in the order that they want them. Once the PDF is returned we will typeset their information in their prescribed order and send you a proof for your customer to approve. Once approved, we will print the forms and blind drop ship them to your customer.